It's been a mixed week at Chez MIA. The kids came back on Monday morning Sick As Dogs. Anyway, 6 GP visits, (8 if you count mine), and 4 times emptying my bank account at our local chemist later, the kids are finally on the mend. The bad news is that I have now succumbed to the dreaded lurgy. Having woken up early a couple of mornings ago coughing up my lungs (sorry for TMI), my kids sprung into action. Miss 7 offered cuddles and painkiller, and Mr 9 cooked scrambled eggs. (We had no bread for toast, as both kids are going through a no-bread phase at the moment. "We've gone off it," Miss 7 explained helpfully, she whose lunch usually involves vast quantities of vegemite sammies. Go figure.). Magically, in the two hours spent waiting to see my GP (she is good, so is always running late), the throwing up part of the illness started to ease. (It may have been due to the stemetil I'd taken that morning - another Nana Standby - but still, I was grateful). The kids' have officially been given the all-clear to return to school, much to my relief. As every parent knows it's dreadful trying to care for others when you're in need of pampering yourself. So far, I've only got to the bronchitis stage, not pneumonia, which is a huge relief. Okay there is sinus, and a sore throat and cloggy ears, but I'm going to live. We don't generally celebrate Halloween in Australia, but having experienced it in Auckland a couple of times, the kids love it. In New Zealand, C. and H. loved dressing up, for school as well as for trick-or-treating. At school, everyone from the janitor to the principal wore ghoulish costumes, and passersby waved and tooted as we walked to and from school. I was amazed at how generous and ready our neighbours were for our Trick Or Treaters. Many had dressed up themselves, and were holding Halloween parties; while the singles/no-kids crowd, who weren't prepared, actually gave the kids money. Others, who didn't want to feed the kids lollies, had made cute cupcakes or biscuits. Can you believe it? I've explained that most Aussies don't celebrate Halloween. I know there are some Halloween-friendly areas, but that's usually where a few parents have gotten together and agreed to Trick Or Treat for the sake of their kids. After a really yucky week, we've been inspired by one of my favourite bloggers NotQuiteNigella, to hold our own Halloween party. That gets us out of potentially annoying the neighbours by Trick or Treating, but gives the kids a taste of the fun. But I've made the executive decision, and as well as medication, we've stocked up on a few must-have dress-up aides, like fake nails and vampire teeth. We're going to make monster pies, gravestone biscuits and other wicked treats, a'la Not Quite Nigella's infamous Halloween parties. And hopefully we'll have a (monster's) ball! 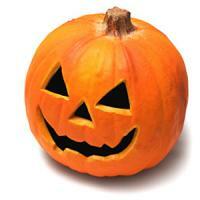 So readers, do you celebrate Halloween and why/why not? While H. was a wicked witch. (This photo taken at school). Absolutely despise halloween and anything else that goes further towards American-ising Australia. Anything that teaches kids that it's ok to take "candy" from strangers, or knock on their doors is so fundamentally wrong in my mind that it just freaks me out. Absolutely and totally against Halloween. I'm the one the fence type of person I hate the American version of Halloween. Where you start by knocking on just your streets doors cause you know some of the street, but after that it spreads to the whole neighbourhood. I don't think we should sending a kids a mixed message by saying hey don't talk/take things of strangers or go with them. Then for one night a year throw that commonsense out the window so they can get candy of strangers. I do love the UK idea of hosting a Halloween party where you invite your friends and they all bring a bag of lollies (don't have to be dear) for the kids at the party to share. So in a nutshell door knocking on Halloween is a big NO from me, a party you host is a big YES. can we go to Mount Splashmore? I'm in the anti camp. Hate the American-ism and commercialism of it. Have nothing against parties where kids get the opportunity to dress up in costume. On the other hand I was in Canada for Halloween one year and loved every minute of it. Couldn't understand their enthusiasm for it though, a workmate of my daughter's takes the two weeks before Halloween as his holidays every year to do up his house - and it was incredible. I do try to believe "to each his own" but it hasn't kicked in with this. I find it interesting that Australia which is generally so much more Americanised than NZ is so much less in Halloween! ps. hope you're feeling better soon -sounds like a nightmare!